Prime Minister Jack Guy Lafontant and European Development Commissioner Neven Mimica signed a 45.3 million Euros agreement on Thursday at the National Palace for the construction of the road. Construction is due to begin by May 2017, the work will be done by Haitian firm Vorbe et Fils and the French firm Razel BEC. work is supposed to be completed in 24 months. The construction of this stretch of road is overdue. finishing this road will link Haiti Centre department to the North reducing the time it takes for northern residents to reach capital Port-au-Prince. 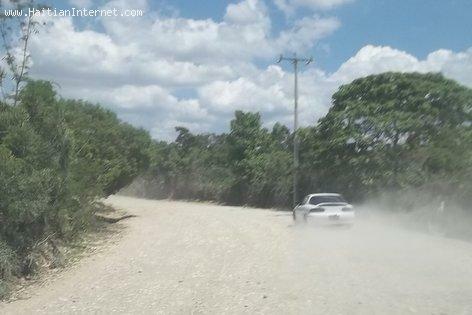 The construction of this road will be an important step for the development of Haiti. this road construction is long overdue. Politics prevented in the past the construction of this road. Previous authorities from Artibonit department wanted to keep the link with the North for the benefits of their buseniss. Mwen sinyalé nou kém pa désidé fè politik ankò, mwen préféré plis konsantrém plis sou travay bonDyé a tankou Jean Baptiste.